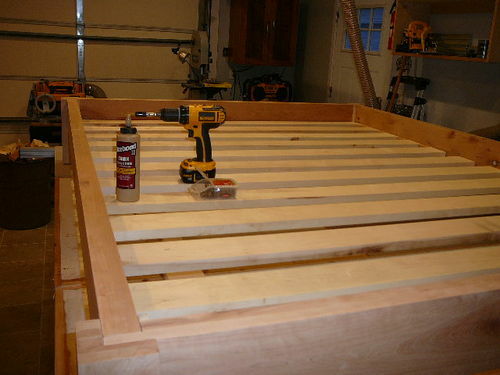 Over the past couple of weeks I’ve been working on a new queen size bed for my daughter (see the blog for the details). She found the design on a DIY site. 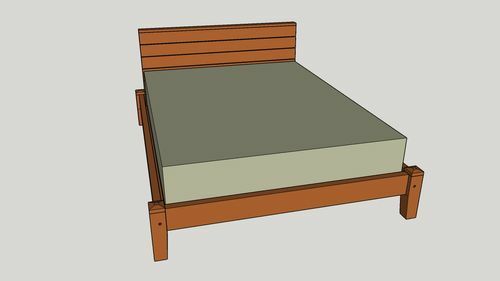 The original version was made from 1×6 pine which just didn’t seem sturdy enough to make a bed frame. I made a SketchUp model for her to look over. I asked her what kind of wood she wanted, as long as it was cherry. Of course she agreed, but she wanted to paint it. After some discussion we settled on staining the cherry with a walnut stain to darken the wood. The rails are 1-3/4” thick x 6” tall, made by gluing up 7/8” boards. 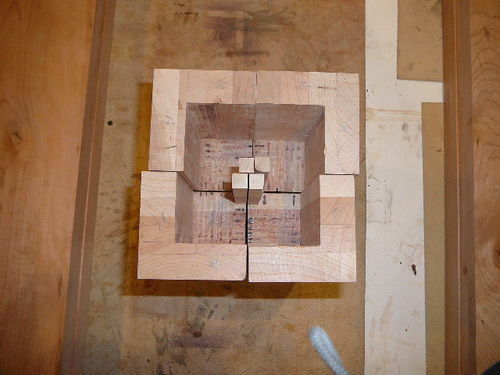 The legs are 3-1/2” x 13” (4 – 7/8” boards). The legs were notched out to fit the end and side rails. The end rails also had a rabbet cut into the end to accept the side rail. 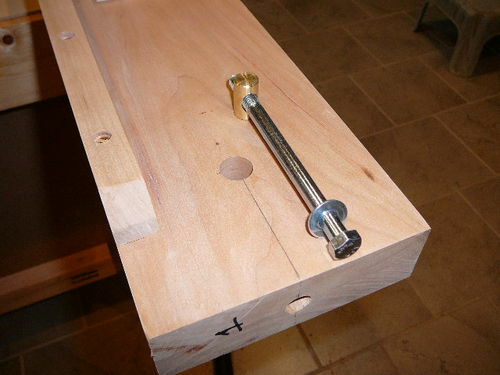 The end rails were glued into the feet and the side rails are connected to the ends in with bed bolts. 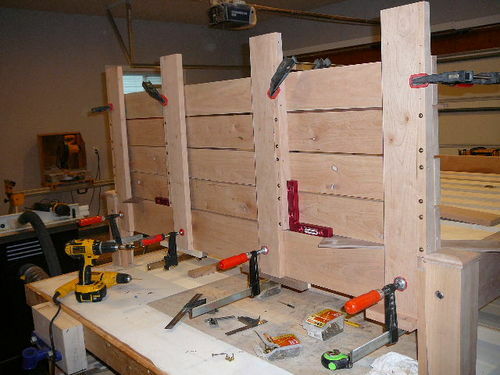 A series of 4 ribs holds the 22-1/2” x 60” headboard to the head rail using knock down bolts. The ribs taper from 1-3/4” wide at the bottom to 7/8” wide at the top. Since we didn’t want any screws showing on the headboard, all of the slats are screwed in from the back. 4” wide slats, spaced every 3” will support the mattress in the frame. 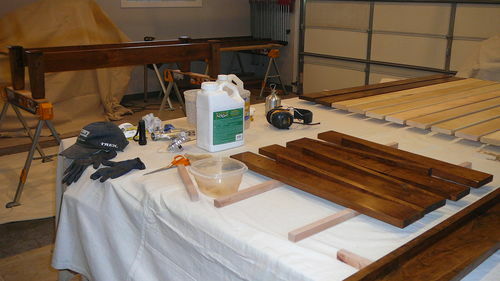 Finishing consisted of walnut stain followed by 3 coats of Arm-R-Seal semi-gloss sanded with 800 grit between coats and lightly finish sanded with 2000 grit to reduce the sheen slightly. This is a good looking bed and beautifully done. very cool bed earl your daughter has nice taste in furniture,but my heart skipped a beat when you said she wanted to paint the cherry wood buddy,but I took a deep breath and continued reading that you changed her mind on that idea, thank god-lol.great job. That is one awesome bed. I wish I built my own instead of buying one.